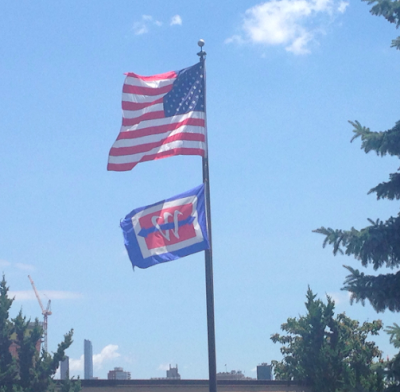 NY Waterway flag below at the former Union Dry Dock site earlier today. Wednesday night Stevens Institue hosted the Army Corps of Engineers for a hearing on the determination of the former Union Dry Dock hosting operations for New York Waterway. Hoboken residents joined local officials in urging another solution foregoing refueling operations at the location but the likelihood from your friendly neighborhood Horsey says a decision is likely coming sooner than later. Once it does, Hoboken's historical character of sea vessels coming and going will more likely than not be preserved with NY Waterway operating on the Mile Square City shores. Talking Ed Note: Hudson County View covered the almost four-hour hearing filing its video/report. A local heckler decided it was a good time to take their foaming marching orders from the "No Borders' nihilist Left and shout at Freeholder Anthony Romano about Immigration & Customs Enforcement (ICE) work/funding efforts in the county. Maybe MS-13, reportedly taken hold in the area should come down the hill and lop off his head and those stupidly applauding.